There were those claiming to be wise before the event and others claiming to be wise after the event. But many people who were expected to be in the know were taken by surprise when they picked up their newspapers on October 22nd 1987 and read that Mwalimu Julius K. Nyerere had been nominated by the CCM Party’s National Executive Committee as the sole candidate for the Party Chairmanship. Many were even more surprised when they learnt that the nomination had been unanimous. Some recalled vaguely how they thought they remembered Mwalimu saying some time ago that he was resigning as President of the United Republic, but would continue to serve as Chairman of the Party for two more years. They seemed to recall something about him retiring to his village to keep his six cows (Bulletin No 23). Then there was the Seminar about ‘Tanzania After Nyerere’ and the worry of one speaker at the seminar about the painful thing it would be for Mwalimu to find himself sitting in his Butiama village and seeing his progressive achievements eroded away (Bulletin No 25). Later, Mwalimu had taken on an important new international post – Chairman of the South Commission (Bulletin No 26) which many expected would take a lot of his time. In Bulletin No 27 we quoted from a paper by Dr. Haroub Othman who had stated that “despite his absence from the Presidency, Nyerere will continue to be a great influence on the country even after he retires as CCM Chairman in 1987”. Another assumption that he would indeed retire. Even more recently, at several meetings in 1987 (Bulletin No 28), Mwalimu was himself quoted as saying that the two posts of President and Party Chairman should be held by the same person. That person could only be President Mwinyi. By the middle of 1987 speculation as to what would happen intensified both inside and outside Tanzania. Mwalimu, when asked, as he was frequently, said that the matter would be decided by the Party Congress due to meet in October 1987. In August, the widely read Tanzanian Catholic newspaper, Kiongozi, quoted in Africa Events, rather surprisingly and directly entered the debate. It wrote: “As time has passed, President Mwinyi has demonstrated his competence in leadership and those who thought he might be unequal to the job find they have misread the script. Just like Nyerere, Mwinyi is an intellectual and a simple man who is given to piety …. However, what is amazing is that some ordinary people and some Party and Government leaders have emerged to launch a secret campaign aimed at persuading Nyerere to continue to lead the Party, the reason being that we still need his wisdom. We must accept that there is no leader who can claim to be indispensable or irreplaceable. As human beings go, they are all prone to err. Equally, to each man his own style of leadership. This being the case, there is no substance whatsoever to the claims of some leaders that Nyerere should continue as the Party Chairman. If the point is to benefit from his insights, he can still offer them in his capacity as an ordinary member of the Party”. Until a relatively short time before the Party Conference some uncertainty remained. Africa Events, in its November 1987 issue, recounted the story of what it described as a visit, sometime earlier, by one of Nyerere’s old friends, to see him in Dar es Salaam. After the usual preliminary hearty salutations, the visitor lunged straight towards the heart of the hottest issue of the day. Was Julius going to call it quits? The answer was sober and frank. “Yes” the visitor was told. “Why?” he asked. The answer was that Mwalimu needed to have time to write his memoirs, to fulfil his new duties in the South Commission and do other things. But the visitor was not satisfied. What was the real reason, he wanted to know. The real reason, he was told, was that Mwalimu had had a lot of time to tour the country during the last year on behalf of the Party. He had been listening and talking to Villagers. He could not help noticing the unmistakable signal in their eyes. They were telling him that it was time he went. It was clear that most Tanzanians would prefer to see the back of him. And that was why he was not standing for re-election. The press in Kenya joined in the speculation and indicated a certain desire that Mwalimu should depart the scene. The Daily Nation wrote to the effect that it had been suicidal to try and apply a policy of socialism in a situation where there were no socialists. The Economist, which is not an admirer of Mwalimu, was very blunt in its October 17th issue. “Mr. Nyerere … will probably find the forthcoming conference less comfortable than the international goodwill circuit …. delegates will, if their country is lucky, hear Mr. Nyerere announce that he really is retiring”. major article under the heading ‘Mr. Julius Nyerere, will he resolve to leave the political scene?’ After examining all the evidence, the writer, Le Monde’s correspondent in Nairobi, was not sure. The Third National Party Conference. Before attempting to interpret what happened, a reference to the Conference itself. It was the first full conference since the 1982 one in Dar es Salaam. It was held in one of the National Milling Corporation’s godowns (completely transformed inside for the occasion) at Kizota, five kilometres from Dodoma. It was big – 1,931 delegates accommodated in schools, houses and the newly extended – from 30 to 96 rooms – Dodoma Railway Hotel. Thirty four foreign delegations stretching alphabetically from Albania to Zimbabwe. Ambassadors, Founder members of the two parties (TANU and ASP) from which the CCM was formed. The Conference lasted 10 days, from October 22nd to 30th 1987. And what did it do? It elected the new leaders of the Party including the new National Executive and Central Committees (with two surprise results – see below); three thousand candidates were nominated for positions on the NEC and a subsequent short list contained the names of 300; these three hundred were competing for 90 national seats of which 10 were reserved for women, five each for youth and the armed forces and 20 for Zanzibar. There were 122 candidates for the 40 regional NEC seats. The Conference also considered a draft 15-Year Party Programme and Economic guidelines for the next five years. The Party Programme is an 88 page green booklet, the first of its kind to be issued by the Party. Its text is said to include, among other things, reference to internal counter revolutionaries and external enemies, the raising of the ideological consciousness of the masses, the need for regularity in Party meetings, strict discipline and democratic procedures, collective decision making, the continued relevance of the Party leadership code, the gradual abandonment of the ‘mixed economy’ concept perpetuated by petty bourgeois forces and the firm resolve of the Party to build a new economic system to serve a socialist society. Mwalimu Warns on Wealth Accumulation. In the opening session of the Conference Mwalimu Nyerere returned to some familiar themes. He called for concerted action to check the emergence of a class of the rich. He said that some dishonest public servants and unscrupulous individuals were taking advantage of the severe economic difficulties to enrich themselves. If this trend was allowed to continue, he said, it would jeopardise national peace and stability. He explained that the number of people questioning the sincerity of leaders had grown rapidly and there was a feeling among the people that the contradiction between what some leaders preach and their actions was widening. “I am not saying that these questionings and this cynicism has yet become sufficiently widespread to be immediately dangerous to our equality and our stability. But I am saying that a trend can be discerned and, unfortunately, the facts to support it are there to be seen …“. Mwalimu gave the example of retired leaders who immediately mobilised capital to launch capitalist enterprises. Though there was no law against it, the practice raised doubts among the people as to the sincerity of such leaders’ previous speeches in support of Ujamaa. It was also being suspected that the rich had better access to important publicly provided services, that they had powers to bend the law and that they were quietly exercising influence on policy making. “We have people in prison because they cannot pay the development levy and we have rich people who do not pay income tax or pay very little. We have people who go to bed hungry and we have people who throw food away” Mwalimu said. In his peroration, Mwalimu continued “Troubles make weak and chicken hearted people cry; effective people, with strong hearts, are matured by them. We are poor in material goods but we are not chicken hearted. We have the strength of unity and confidence which comes from knowing that we are fighting for justice and equality both within our country and beyond its borders …. If we continue to keep a firm hold on the rudder of our unity and if we continue to have confidence in ourselves and our objectives, we are not afraid of storms. Let them blow. Our vessel will be tossed about by the waves and wind; often it will veer from the course; but it will not lose direction and will return to the sea lane. Finally we shall resume our journey with more power and arrive safely at the destination”. The day before this opening address the National Executive Committee had unanimously nominated Julius Kambarage Nyerere as the sole candidate for the Party chairmanship. At the same meeting Ali ‘Hassan Mwinyi was nominated the sole candidate for the post of Party Vice-Chairman. Ten days later the Conference delegates voted. Mwalimu received 1,878 votes out of 1,910 cast. Mr. Mwinyi got 1,907 out of 1,908. Mr. Rashidi Kawawa was re-elected as Party Secretary General by 158 out of the 159 NEC members who voted. Many well known persons failed to be elected to the NEC including the Deputy Ministers of Local Government and Cooperatives and Agriculture and Livestock Development, the Chairman of the Leadership Code Enforcement Commission, Mr. Selemani Kitundu and )Is Lucy Lameck. Fifty two of the new NEC members are university graduates. On November 2nd came the elections for the powerful Central Committee of the Party. And here there were two surprises. The dynamic Chief Minister of Zanzibar, Seif Shariff Hamad and the Minister of Finance, Economic Affairs and Planning, Mr Cleopa Msuya, who had previously been members, failed to be elected. In the first case the intricacies of Zanzibar politics must have played a role and perhaps Mr. Hamad has been a little too direct in his relations, particularly with older colleagues. In the case of Mr. Msuya one can only conclude that the IMF medicine which he had prescribed for Tanzania is either too potent for the taste of certain of the patients or there are genuine fears amongst Party members that it was not the correct prescription in the first place. A further change was the appointment of Prime Minister Joseph Warioba as Secretary of the NEC Commission for National Defence and Security in place of Mr. Salim Ahmed Salim, the Minister of Defence and National Service. Why was Mwalimu Nyerere Re-elected? a) A request to him to accept re-election from the only possible alternative candidate – President himself. President Mwinyi may well be feeling the pressures of high office. He is deeply involved in tackling the serious economic crisis and in negotiations with the IMF and with donor countries. He is becoming more involved in the struggle in Southern Africa after his participation in the Commonwealth Conference in Vancouver where this was again the main subject under Discussion. He must worry about the involvement (an involvement which it is understood was entered into with great reluctance by Tanzania in view of the economic implications) of the Tanzanian army in northern Mozambique. It can easily be understood that President Mwinyi might prefer someone else to handle the affairs of a political party of the size and constitutional importance of the CCM. b)Mwalimu Nyerere’s own disappointment at the state of the Party as revealed to him during his extensive touring of the last 18 months. Mwalimu must have felt a sense of duty in wishing to continue to try and strengthen it; he has not hidden his view that many of its leaders are lacking in the socialist ideals to which he attaches such importance. c)The Party members themselves must have had a clear interest in retaining in charge the person who formed the Party, who believes in it and who can best defend it. d) The political situation in Zanzibar remains delicate (Bulletin No. 28). Mwalimu Nyerere was really the architect of the Union between the mainland and Zanzibar. He is much respected there and is presumably anxious to see the Union very firmly established before he relinquishes the power to help bring this about. e) Perhaps the most important factor of all – a growing feeling that the country is less united in its policies and objectives than it was. Tanzania is an island of free speech amidst much oppression and Tanzanians have been becoming more and more outspoken in different directions. Yet they do not have to look very far to see what happens when a country is not united. Mwalimu Nyerere is also fully aware of the key role of the army in the African context. The importance of stability must have been apparent to all. By re-electing Mwalimu Nyerere, the Party members have indicated that continued stability remains high in their list of priorities. Mwalimu Nyerere confirmed much of what has been written above in the speech he gave at the Conference on October 31st 1987. He said that it was the need to strengthen Party democracy and the pressure of events – both domestic and international – which made it difficult for Tanzania to re-combine the Party Chairmanship and President in one person for the time being. The President found it difficult to find time to do the needed Party work. “Ndugu Delegates, Twice I have had the honour of having my name proposed at the Party’s National Congress for election as CCM Chairman for periods of five years. On neither occasion was I compelled to make an official acceptance speech. But on this occasion I believe that it is inevitable that I should do so. I have been stressing the danger of divisions that could emerge in our nation between two groups – a group led by the President of the country and a group led by the Party Chairman. Even if there is no difference between the two leaders themselves, such a difference could emerge as a result of their tasks. It has been argued that this is not the right time to combine the tasks of Party Chairman and President. Although all of us accept that normally both caps should be worn together, it is appropriate for the time being to allow more time for the strengthening of our Party. The other argument put forward is that I and President Mwinyi have worked together on the basis of excellent cooperation … so it is argued that if this period is extended, there will be no danger of creating divisions in the Party and our nation …..
Ndugu CCM members, it is appropriate that I should avail myself of this opportunity to affirm to CCM members and all the people of Tanzania the reality of the situation ….. Reports … published by the international press and media and whispered by those who wish to create chaos, agents sent by people outside (applause) have always been untrue and fabricated reports. Truly, the motive of such reports is envy. They are made in the hope that they will help divide us. If they did not divide me and President Mwinyi, perhaps they would divide the people of Tanzania. And even where there are no divisions, newspapers, our enemies’ broadcasts and the fools in our midst (laughter) would continue to sing: divisions do exist – they are there between the President and the Chairman. Eventually, even reliable people could start believing that this is true. They would quote proverbs like: if it is spoken about, it exists. They would say: even if it does not exist now, it is coming (laughter). Ndugu members and Ndugu citizens: there is no split between the Chairman and your President. It does not exist (shouts and prolonged applause) …. I wish to state this: I have resolved to accept the nomination Ndugu President for two reasons. Firstly, it is true the arguments about the strengthening of our Party are valid. And secondly, the fact is that you, the country’s President, wish me to do so”. Reaction to his re-election was very enthusiastic at the Conference. Otherwise, they appear to have been rather muted. 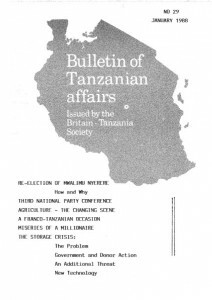 The Tanzanian Daily News confined itself largely to factual descriptions of the events. Several messages of congratulation were reported to have been sent to Mwalimu from within and without Tanzania. The British press almost entirely ignored the event and the news came too late for the African monthly press based in Britain to comment. Africa Events, ever alert to happenings in Tanzania, in its November issue, in a column headed ‘Shop Talk’, thought that the Party had been a ‘spoil sport’. In re-electing Mwalimu Nyerere it had denied the old campaigner the joy of lazing it out on the quiet fringes rather than in the bustling centre of power. “More importantly, the Party has again shown how far removed is its ear from the national pulse on the ground ….. the price of gross political expediency is diminished goodness in ideology”. Any recent visitor to Tanzania is bound to observe certain changes in the agricultural scene. These changes are related primarily to the improved input supply (machinery, spares, fuel, chemicals and fertilisers) and the better prices now available for crops. Most noticeable are the imports of the agricultural inputs which have been assisted by foreign exchange support from aid donors. Producer prices for the major food crops are being kept at a level which has stimulated production. Tanzania has a surplus of maize and a major headache over how to move and store it. However, high inflation and soaring prices of imported goods as the ‘shilling has depreciated, have made long term planning for farmers very difficult. To date, the improvements to production have been achieved with minimum new investment. The fundamental restructuring of agriculture to allow a greater role for the private sector from production through to marketing is a longer term process. Recent Government policies are generally pointing in this direction. Having achieved food self sufficiency the emphasis now is on export crop rehabilitation. The driving force for this export crop rehabilitation is recognised as being the private sector. The Government is trying to reduce its own role as a direct agricultural producer on large state-owned farms and ranches. For example, a recent development has been the leasing of National Agricultural Food Corporation (NAFCO) land in Arusha to the private sector for the cultivation of food crops. Another example is the sale of formerly nationalised sisal estates. Certain Government coffee estates in the Kilimanjaro and Arusha regions are also understood to be in the process of transfer to the private sector. Already, the privately owned tea and sisal industries are investing in new equipment and professional management. Coffee is heading in the same direction. As production from small farmers and private estates increases, the need for Government owned farms is reduced and Government resources can be released for the improvement of the infrastructure, import of inputs and development of research. The Government is keen to encourage non-traditional exports as well so efforts are being made by entrepreneurs to set up new horticultural and fisheries businesses. Crucial to the success of these efforts to attract investment is the liberalisation of export marketing, to allow funds to be retained outside Tanzania to cover the foreign exchange costs of the farming operations in the country. The support services for agriculture (input supply, transport, credit, marketing) are still weak and in need of investment. Here a major role should be played by the cooperatives, in the supply of inputs and in the collection and marketing of crops. At the moment the burden on the cooperatives is too great as their financial and administrative abilities remain weak after their reconstitution in 1984. The Tanganyika Farmers Association (TFA), a private cooperative organisation based in Arusha, has continued for many years to provide a valuable lifeline to farmers. The role of membership-based organisations like TFA in providing support services and an interchange of ideas for farmers is most valuable. International reaction to these developments has been positive. This bodes well for the success of Tanzania’s efforts to develop new and traditional export markets in accordance with recent Government statements. The National Assembly had a short session in November 1987 immediately after the Party Conference. Over 500 questions were submitted by members. The Member for Iringa West asked about the crime situation in the country. Reply: Theft of public property has fallen in the last three years by 23% There were 914 incidents in 1984 and 697 in 1986. Burglaries had fallen by 8% from 3,512 to 3,323 cases. Some 624 weapons had been impounded in the last three years. Special campaigns had been launched in areas with a high rate of crime like Tarime and Serengeti districts. Reply: Expelling Britain from the Commonwealth was not a solution to the problem in racist South Africa. But Tanzania was opposed to the British stand as expressed by Mrs. Thatcher during the Commonwealth Conference. Commonwealth countries had accepted the idea that they might have differences of opinion on some issues. The Member for Kongwa asked how soon the godowns at Kizota, one of which had been used for the Party Conference, would be used for the storage of grain. Reply: Two of the godowns would be filled immediately with 20,000 tons. The third would take a short time to be cleared of conference equipment. The Member for Mwembe-Makumbi asked about wheat production. Reply: Wheat growing regions were expected to produce some 75,000 tons of wheat in 1987. 53,000 tons from Arusha region, 14,000 tons from Iringa, 5,600 tons from Ruvuma, about 2,000 tons from Mbeya and 1,200 tons from Rukwa. Wheat production in Mbulu had gone down because of lack of combine harvesters and for no other reason. The Government was assured of smooth running of the Canadian assisted wheat project in Hanang even after the departure of Canadian experts. “There is a time when we have to be self-reliant, relying on our own people” the Deputy Minister of Agriculture said. Reply: The two shops were run as a partnership between the ‘Biashara Consumer Services’ and the ‘Palestine Martyr Organisation’. They had raised some U.S.Dollars 487,000 since they were opened two years ago. 39 Tanzanians were employed in the shops. The Member for Muleba asked about honey exports. Reply: About 10,500 dollars had been made from honey exports and about 854,000 dollars had come from export of beeswax during 1984/85 and 1986/87. The most heated debate during the session was on one clause in a new Bill which makes the possession of a sum of over Shs 1.0 million in the home a criminal offense. The Minister of Justice said that hoarding money was a crime of economic sabotage. Others said that it was unreasonable to force people to put money into banks when these were often situated at long distances from peoples’ homes. The Bill was eventually passed by 57 votes for to 47 against. This latter Parliamentary event persuaded Sunday News humorous writer Adam Lusekelo to put pen to paper. He commented “The Governent’s Chief Law Officer feels that people who move about with a lot of money or sleep on mattresses stuffed with millions should be asked why they are doing that. If they don’t give a sufficient answer they will be punished. Now this could be tricky. Is someone telling us how we should spend our money? I thought how I should spend my money was none of anybody’s bloody business. Of course, I could understand if the Chief Law Officer was concerned with people who stuffed money in their right pockets …. you could then be charged with the unforgivable in ideological crimes. It could just mean that you are a rightist capitalist roader. And rightist capitalist roaders will never sway us from our cherished goals of socialism. But then dear reader, the million dollar question is – what are we supposed to do with the money? But our ancient banking system still demands that you write a Cheque and then wait for hours while watching pretty bank clerks swinging their derrieres now this way, now that ….. The only remedy is to have a girl friend in your local branch. Which doesn’t sit well in this age of that deadly terror called immunodeficiency virus. The CCM Party has offered rewards of Shs 5,000 to persons able to kill lions in Tunduru district. Man-eaters have killed 36 people during the last three years in the district. 16 villages along the Tanzania-Mozambique border have been affected. But Daily News writer Reggie Mhango is sceptical. He wrote that there were rumours locally to the effect that the man-eating lions were man sent. A Mozambique poacher was said to have been conned of his rhino horn by corrupt Game Scouts who, after impounding the trophy, sold it themselves. The writer noted that among the victims of the lions had been a number of Game Scouts. Another story he had heard was that a Tunduru resident who had been wronged by a neighbour had obtained a herbal concoction with which to settle scores. He lost the ‘prescription’ which was concealed in a rope. The rope was allegedly the lion and it killed him. After that the lion had satisfied its hunger on the 36 other human beings. Although the writer considered both stories to be bizarre he noted that they were in agreement on the possibility that there had been only one man-eater. He wondered whether any of the 15 lions killed in the hunt so far had been man-eaters. He was concerned that Tanzania might thus be in danger of losing one of Africa’s proudest animals. With reference to the short report in the May issue of the Bulletin on the suspension of 297 students (out of 500) at Sokoine University of Agriculture I would be most grateful if the following facts were brought to the attention of your esteemed readers. – The students were suspended for removing from some of the rooms double decker beds which had been installed for those who opted to use them. They had a choice to live off-campus and receive Shs 2000 monthly to meet costs involved. They were also suspended for obstructing their colleagues from using the double decker beds. Finally, they were suspended for refusing an order of the Executive Committee of Council requiring them to install the beds they had dismantled. This indicates that refusal to live in threes in rooms designed for two was not the basic reason for the suspension. They had the freedom to live off-campus if living in threes in rooms designed for two was considered (by them) to be inconvenient. – 250 of the 297 (the figure was 296) resumed classes on 15th March 1987, 25 were suspended up to the end of 1987 and the rest up to the end of 1990. Council set up an ad hoc committee to investigate causes for the unrest. The suspended students were also allowed to use their right to appeal to a statutory Disciplinary Appeals Committee. – Council, at its meeting on 2nd September, received reports from both committees. Council has allowed all those still on suspension to resume studies in January 1988. This follows from the advice of the two committees. I hope that this information will help to get the facts up-dated. Fortunately, one of the hard-won liberties of the 1980’s is not to have to pay the slightest attention to economists. Their capacity for producing conflicting analyses of trees while missing woods is inexhaustible. I was however struck by the fact that the quote should appear close to an account of a Frenchman’s tourist experiences in Zanzibar in which he found the Kenyans not very pleasant and the Tanzanians friendly and happy. I will personally fund five days in a Nairobi shanty town for that Economist feature writer’s next holiday, to be followed by five days in any Tanzanian village, so that he may return to Berkshire, or wherever, with his spirits revived. Tanzania may be going through an economic upheaval, but it is in the strength of Nyerere’s ideas and policies that that upheaval brings immediate and tangible benefits from the top to the bottom of society – even though the policies themselves have necessitated the upheaval. Name me one other country where the same has been, or could be, achieved. I refer to your article in Volume 28 of the Bulletin concerning the views expressed by Eileen Stillwagon on oppression of women at the University of Dar es Salaam. I do not entirely agree with the impression created by Ms Stillwagon. The ‘Wall Literature’ on a wall at the back of one of the cafeterias is used as a mechanism to check the behaviour of members of the University community, not the women alone. Thus, anyone in the University can be ‘punched’, ranging from lecturers to students and the person who ‘punches’ others comes from any part of the University community – not from the engineering department only. In the September issue of the Bulletin I was interested in the contribution by Mr. Godwin Kaduma ‘The Makonde Carving: Its Essence’. For nine years I worked at Newala on the ‘Makonde Plateau’ looking over the Ruvuma River to Mozambique. Members of the Mawia tribe, a tribe in Mozambique, frequently came over from Mozambique to seek work on the sisal estates on the coast and to sell their carvings. The Mawia were a tribe quite distinct from the Wa-Makonde different in their language, manners, habits, characteristics and appearance. Mr. Kaduma describes them accurately in describing Wa-Mawia – not Wa-Makonde! The Wamawia are by nature gifted artists . This is evident in their ebony carvings showing the decoration of their heads, the pattern of their hair treatment, the pattern of their facial markings (Mr. Kaduma calls them ‘tattoed’; actually they are ‘incised’ – carved on the skin); also they file their teeth to a point. A Mawia boy came to St. Josephs College, Chidya; he stood out clearly from the others especially in his gift for drawing pattern and picture making. I understand that a group of Mawia settled near Dar es Salaam and sold their carvings which came to be known as ‘Makonde carvings’. Someone better qualified than me could give the Mawia their due and describe their characteristics. The late Dr. Lyndon Harries shared life with me at Newala for a time and studied the Mawia language and I think wrote about it. I fear the tourists who buy these carvings have spoiled their art by showing their preference for what is less original or, as Mr Kaduma says, less authentic. It is not surprising that Canon Cornwall is puzzled over the Wamakonde and the Wamawia. In fact, they are one and the same although the latter is a nickname. This is explained by J. Anthony Stout in his book ‘Modern Makonde Sculpture’ (1966. Kibo Art Gallery Publications, Nairobi). ‘The Makonde are Bantu Africans and a distinctive people. These sculptors, or, in some cases, their fathers, were born in the north eastern corner of Mozambique. There is also a Makonde people indigenous to the area north of the Ruvuma in Tanzania’. Dias (in his book ‘Portuguese Contribution to Cultural Anthropology’. A. Jorge Dias. Witwatersrand University Press. Johannesburg. 1961) supposes that both Makonde groups were closely related at one time but have developed important cultural differences from their long separation. ‘Mawia’ comes from the Swahili verb ‘wia’ meaning to warm up, begin to boil, or to seethe. Anthony Stout’s book was published following an exhibition of Makonde carvings at Kibo Art Gallery, Kilimanjaro in 1965. Stout also wrote that ‘the times move on and we should not expect modern Makonde art to stand still. The artists have overcome great problems in the recent past because they would not stagnate. Makonde creativity is as unquestionable as life-force’. There is a widespread feeling among Zanzibaris and others that the islands have been neglected in terms of academic research for a very long time. This has been partly because of the intellectual climate over there for the past couple of decades and partly because of the lack of co-ordination between scholars with interest in Zanzibar. The climate in Zanzibar is now changing. The Government there is showing every sign of trying to bring about a revival in education and cultural development. The effort to establish a national library has begun to bear fruit; the Zanzibar archives are being rehabilitated; and the Government is apparently considering a proposal to set up an institute for social research in Zanzibar. The renaissance however will be hampered by the fact that intellectuals with interest in Zanzibar have been scattered over the four corners of the globe. While some have attempted to maintain some informal contact among themselves , most are not aware of the interests and academic pursuits of their colleagues. This may not only lead to duplication of effort but also hamper the identification of the most fruitful avenues of research and collaboration between scholars with common interests. We would like to propose a modest project to help correct this situation. The first requirement is to establish contact with all those with interest in Zanzibar. Secondly, we would like to build up our research resources on Zanzibar . Many of us have written articles (academic as well as newspaper) and books but• these are often inaccessible to many of us when we become aware of them. We would like to propose the setting up of a unit where these materials can be collected. We would welcome two copies of these publications, one which can eventually be deposited in the Zanzibar library when it begins to operate. Readers of the Bulletin can send materials written by others if they are easily accessible or they could be donated. Thirdly, to disseminate information on scholars and publications, we propose a modest newsletter. Unfortunately the cost of production and postage will impose a heavy burden on individuals. We wonder whether anyone would be in a position to share the cost with us in the form of a modest subscription or donation. While such information, if disseminated by the newsletter, will be useful to us all, we feel that the unit can play a useful role in identifying or initiating specific research projects. One such project could be the recording of the experience of the last thirty years of the poetical and other changes on the Islands. Twenty years after the revolution, for example, there is only one scholarly account of it, and that written from a colonial perspective. And yet there are many participants in the political struggle leading up to it who have not yet been induced to put their reflections down on paper or on tape. Some of these participants are already dead and it will be unfortunate if we fail to record the memories of those still with us. Other projects could focus on aspects of culture, scientific development, language etc. We hope you will agree with us about the need to initiate this modest project. Dr. Haroub Othman, Institute of Development Studies, Dar es Salaam. The members of the ‘Association des Amities Franco-Tanzaniennes’ are too modest. On October 23rd and 24th 1987 they held a seminar (or ‘colloque’ as they rather charmingly term it) in Paris (jointly with the Centre de recherche et d’etudes sur les pays d’Afrique Orientale – CREPAO) which was something of a model of its kind. It was held in two locations and squeezed a very great deal into two long days. No tea breaks in France ! There were speeches, as one would expect, and much animated debate, but there were also films, video and slide shows and, at the conclusion, naturally, as we were in France, a convivial ‘diner Tanzanien’. Yet throughout, members were saying to me that they hoped I would not be too disappointed as everything must be so much bigger and better when organised by the Britain-Tanzania Society. Several different nationalities participated, including some fifteen Tanzanians and virtually everyone spoke at some stage (although I was somewhat disoriented when the interpreter suggested that perhaps we would get on rather better if I made my own contributions in my mother tongue!) The interpretation was of a remarkably high standard – especially in one session handled by Father Justo Laconza – now studying at S.O.A.S.in Britain – so that I could not complain. As regards the formal sessions, much had indeed been covered in the wealth of seminars which have been held in Britain during recent months including a presentation not dissimilar to the excellent paper ‘President Nyerere and the State’ by Jeanette Hartmann which was published in Bulletin No. 26. The first address, by Professor Francois Constantin (University of Pau), dealt with Tanzania’s image in France. It was not a very strong image. There was the absence of any colonial connection and many in France had only become aware of Tanzania when a certain French Foreign Minister had become involved, many years ago, in a public altercation with his Tanzanian counterpart at Dar es Salaam airport! But the real reason for the low profile of Tanzania in France had been the lack of eccentricity in Tanzania’s leadership. Reference was made to Bokassa, Idi Amin and others. Perhaps another reason is that the French have not been exposed, as have so many Britons, to the skill with which Mwalimu Nyerere handles the English language. But those French people who were aware of Tanzania had been deeply impressed, according to Professor Constantin, by Mwalimu’s integrity, humanism, life style, moral stature and charisma. Latterly however, things had changed. There had been the economic problems, the corruption and a lot of faulty insinuation. The French Association needed to communicate better and re-establish the truth. Mr. Gerard Fuchs, Socialist member of the French Parliament explained that, for each country, the Parliament had established interest groups. There were some thirty Deputies in the Tanzanian group which made it, numerically, one of the largest. Unfortunately, however, it was not as active as it should be. Father B. Joinet, author of the book ‘Manger d’abord’, gave a colourful address under the title ‘Nyerere – Has He Achieved His Objectives?’. Like a recently graduated student in management technique Professor Joinet first clearly spelt out what he felt the objectives had been. For example, Ujamaa had not been an objective to be achieved. It was an image of a utopia which had not been achieved anywhere on earth. It was an idea aimed to give inspiration. The implication was that development, as such, had not been high in Nyerere’s list of objectives. All employment was an exploitation. There had been, therefore, no proper division of labour as understood in other countries . Father Joinet felt, and he believed that Nyerere agreed with him, that Nyerere had envisaged a nation of modest but self-supporting crofters. On the subject of stability (a matter of particular relevance as the nomination of Mwalimu as the sole candidate in the election for the chairmanship of the C.C.M. had been published in that day’s edition of ‘Le Monde’) Father Joinet referred to Tanzania’s regional administrations. You often found conflicting forces. The Party Chairman might push hard for development; the Party Secretary might want to go forward more slowly. Result ‘stability’. Rapid development could lead to instability. But stability could also mean stagnation. Nyerere had been very far sighted on several occasions. For example, during the war with Uganda, he had instructed journalists not to emphasise the presence of Libyan troops on Uganda’s side. It might prove necessary to work with Gadaffi again at a later date and there was no point in permanently antagonising him. Nyerere’s attachment to his own culture would long be remembered. There was no Government supported ‘Academie Anglaise’ in Dar es Salaam. Clear differences of opinion emerged on some issues. Dr Jeanette Hartmann spoke about two groups that had been jockeying for power in Tanzania. The first group were Nyerere’s men; together a long time; much ideological rhetoric; not wanting too much change so that they could continue to control the political process. Another group were supporters of President Mwinyi. Many of them were in Government trying to find pragmatic solutions to day to day problems. Both groups however were agreed on the need for political stability. Professor Bavu, also from Dar es Salaam University, said that there were not really different groups. Mwinyi had been created by Nyerere. There were however certain ideological differences. Tanzania’s Deputy Minister of Education, who was in Paris for a Unesco conference, said that Tanzania was proud of its twenty-five years of unity and stability. Tanzania had, in spite of all the difficulties, remained as a fundamentally democratic society. Marjorie Mbilinyi, also from Dar es Salaam University, spoke about the sexual division of labour. Cultivating by hand with a baby on your back was very hard. Young women were leaving the land and trying to get any other work. A powerful film on the income – generating activities of women (work carried out without any help from the menfolk) was shown later in the seminar and followed by a discussion. It is called ‘Kumekucha’ (From sunrise) and has been highly and rightly praised in a Daily News review by Martin Mhando. He wrote that the six women interviewed in the film have one thing in common – a clear understanding of their role in society vis-a-vis the man; and that, if a man leaves the theatre after the 20 minutes of being stripped naked of his humanity without feeling guilty then he is no human being. The subsequent discussion on the film in Paris was less successful however than it might have been due to the extreme pugnacity of the film’s producer. Professor Robert Mabele, also from Dar es Salaam University, took part in a brief discussion on the import of ‘useless goods’ (whisky was mentioned). He explained that the Trade Liberisation rules were often breached. Ms Anna Cassam, former Assistant to President Nyerere, spoke with considerable force and passion. France was guilty of cultural arrogance. It was part of the northern world in which there was a lack of comprehension; there were different dimensions of time and space, She spoke of a visiting Parliamentary delegation in the 1970’s from an unnamed European country. The leader had been impressed during his upcountry tour. “You are trying to build democracy and equality” he had said to Mwalimu Nyerere. “But is this going to bring happiness?” There had followed a moment of silence. “No” said Mwalimu, “we are not engaged in metaphysical research. We are involved in a struggle against exploitation and uuderdevelopment. This has nothing to do to do with happiness”. Everything about Tanzania had to be understood as part of a struggle. The struggle with the IMF had not been just a struggle against the organisation in H Street, Washington DC. It had been a struggle against the modern equivalent of slavery. The objective had been to maintain Africa on the margins of the world economic system, France had been the beneficiary; Africans had been the victims. Zanzibar was squeezed in to a short period near the end the seminar. “We are accustomed to that” said a lady from Zanzibar. We were treated to a rather skillfully devised potted history of Zanzibar which, as is customary on these occasions, stimulated some controversy as to what actually has been happening in Zanzibar during the last twenty years. We also heard some strong words about the new mass tourist complex being constructed in Zanzibar and the unfavourable effect it was likely to have on the environment and the social structure. Our French counterparts are deserving of considerable praise for arranging such a stimulating two day programme. One criticism, At the ‘diner Tanzanien’ there was no Dodoma wine. We had to make do with Bordeaux! Since the Zanzibar Government opened the gates to private investment two years ago and enacted a law to encourage foreign private investment, some 19 applications have been received by the Ministry of Marine, Tourism and Forestry for permission to build tourist hotels in the islands. Five of the applicants have been allowed to proceed with construction while the rest have yet to comply with Government requirements before permission is granted. The Government now has in its hands 13 applications from people wishing to become tour operators and travel agents. Seven applications have been accepted and the Isles’ Tourism Director, Mr. Andrew Katema, hopes that the tourism industry will soon be able to contribute to the diversification of Zanzibar’s declining mono-crop economy. – strengthening of jetties at Kilwa and Lindi. Nothing is planned for Mtwara as it is running below capacity; studies are underway for developments at Tanga . THE TANZANIA RAILWAYS CORPORATION was also established in 1977.
on Lake Tanganyika, the German built mv Liemba (700 passengers), mv Mwongozo (400 passengers) and an oil barge – the mv Sangara. on Lake Victoria , the mv Victoria (750 passengers), mv Bukoba (400 passengers), mv Butiama (160 passengers) and mv Clarias (290 passengers); there are also one wagon ferry (the mv Umoja), two motor vessels, each with a capacity of 200 tons, the mv Ng’ombe which can transport 100 head of cattle, two tugboats, an oil tanker and a lighter. The rail service is faced with very serious problems including low availability of locomotive power and rolling stock and short-ages of spare parts. Thus, for example, passenger train frequency has had to be reduced from daily to four times a week on the Central line and to three times per week on the Link Line (to Moshi and Tanga). The road service to the Southern Highlands has 60 buses, 30 trucks, 10 tankers and six trailers. It is intended to introduce new routes to Malawi, Zambia and Kenya in the near future. AIR TANZANIA CORPORATION was formed in 1977. It started with two Fokker Friendships inherited from the defunct East African Airways Corporation and a Boeing 737 leased from DETA of Mozambique. Today there are eight aircraft – 3 Twin Otters, 3 F27-600’s, and 2 Boeing 737’s bought gradually during the last 10 years. The airline serves 21 domestic airports and 12 regional destinations including Maputo, the Seychelles, Lusaka, Muscat, Dubai and Gaborone. Passenger numbers have increased from 85,000 in 1977 to 441,000 in 1986. The airline claims to be operated by 99.9% Tanzanian personnel. THE TANZANIA POSTS AND TELECOMMUNICATIONS CORPORATION came into being in February 1978 and has gradually expanded its services during the last 10 years. In 1978 Tanzania had 562 post offices with 45,444 letter boxes. Today the Corporation operates 740 post offices with some 82,000 post boxes. But this growth follows far behind the demand. Over 40,000 people are on waiting lists for post office boxes because of lack of wall space in existing buildings and shortages of locally made boxes and locks. The greatest advance in telecommunications was the commissioning in 1979 of the first satellite ground station at Mwenge, Dar es Salaam which has 60 voice grade circuits to handle telephone, telex and telegraph traffic. The Mwenge station has access to the INTELSAT satellite over the Indian ocean thus providing links between Tanzania and the rest of the world. A further important development was the completion in 1982 of the Tanzanian part of the Pan African Telecommunications Network (PANEFTEL). The microwave link stretching from the Namanga border in the north to the Tunduma border in the south has greatly improved the quality of the country’s telecommunications services with Kenya, Uganda, Zambia and Ethiopia. In February 1987 the Corporation signed a contract for 514 million shillings for the installation of a new Grade A ground satellite station at Mwenge which should result in further improvements in service.